Animated: No; Low-poly: Yes; Materials: Yes; Rigged: No; Textured: No; UV Layout: No; 3D File Formats Included: .3ds (multi format), .blend (blender), .fbx (multi format), .obj (multi format); Created In: blender; Geometry: Polygons; Poly Count: 254. You have to keep water clean and safe somewhere right? 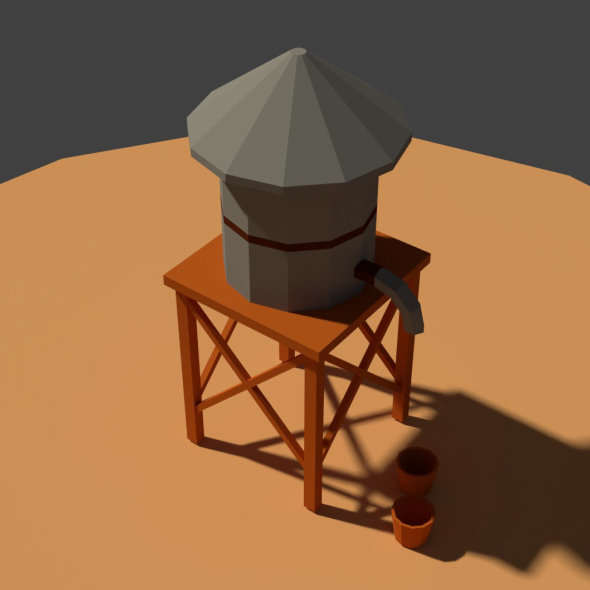 Low poly cute well model and also a little wooden bucket. Check out the wireframe preview images as well. Low Poly Farm House 2; Low Poly Farm Cart; Low Poly Cowshed; Low Poly Farm House; Low Poly Greenhouse 2; Low Poly Greenhouse; Low Poly Cartoony Granary 2. Keywords: agriculture, bucket, carry, chicken, clean, dairy milk, entrance, farm, fence, flower, fountain, hay, high, modern, pig, residence, stable, stack, tower, water, well, windmill, wood. Best stock graphics, design templates, vectors, PhotoShop templates, textures & 3D models from creative professional designers. Create 3DOcean Low Poly Farm Well 20953809 style with PhotoShop, Illustrator, InDesign, 3DS Max, Maya or Cinema 4D. Full details of 3DOcean Low Poly Farm Well 20953809 for digital design and education. 3DOcean Low Poly Farm Well 20953809 desigen style information or anything related.